In 2014, The City of New York issued a Request for Proposal that called on the technology and media community to reimagine the City’s obsolete payphone infrastructure, and bring free public Wi-Fi to the streets of New York to help bridge a growing digital divide. As a result, a groundbreaking public-private partnership formed between the City of New York and a consortium of private companies to launch LinkNYC in January 2016, the largest and fastest free public Wi-Fi network in the world. Replacing more than 7,500 outdated payphones, each Link delivers free high-speed gigabit Wi-Fi, phone calls, USB ports for device charging, a touch screen tablet for internet browsing and wayfinding, 911 emergency button, and a platform for civic and commercial applications, bringing connectivity and digital touchpoints to every community and commercial street corner across New York City. As New Yorkers ourselves, we built a product we’d want to use in our everyday lives. That meant creating a seamless and ad-free Wi-Fi experience to start. To further ensure that LinkNYC serves a city as large and diverse as New York, we conducted user research with people that represented the City’s range of needs, including city employees, the elderly, business owners, digital natives, and underserved communities. Through iterative concepting and rough prototypes, we learned how specific proposed features resonated, or didn’t, with each test group, informing LinkNYC’s design and features. Taking cues from free digital services such as email and social media, which are paid for by advertising, LinkNYC adapts that model for the physical environment to address critical urban challenges like disparate digital access and surging data consumption. It meets the needs of the largest, most diverse and pedestrian-focused city in the U.S., while bridging a digital divide for the millions of New Yorkers who do not have access to high-speed internet. 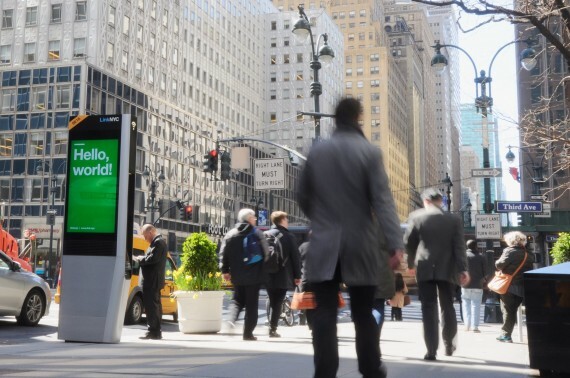 Free to users and at no cost to taxpayers, LinkNYC is funded by advertising on the kiosks’ 55” digital displays, offering a hyperlocal medium for brands to engage with consumers that will also generate over $500 million in revenue for the City. Since the project commenced, the City has realized hundreds of new jobs and millions in economic activity. More than 400,000 people have registered to use the Wi-Fi and the network is gaining more than 30,000 new users per week (as of August). Meanwhile, some of the world’s biggest brands are leveraging the flexibility and intelligence of LinkNYC’s advertising platform to engage with consumers in new ways, all while helping finance a valuable public service. We’ve seen a lot of engagement and excitement around these efforts and look forward for what’s to come as the network continues to expand. Currently, LinkNYC is in beta, giving New Yorkers an opportunity to try out features, provide feedback, and take part in creating the future sidewalk experience. This product and approach to urban infrastructure and public service has set a new standard for cities around the world.